Symposium scene, circa 490 BC. Wikimedia Commons. 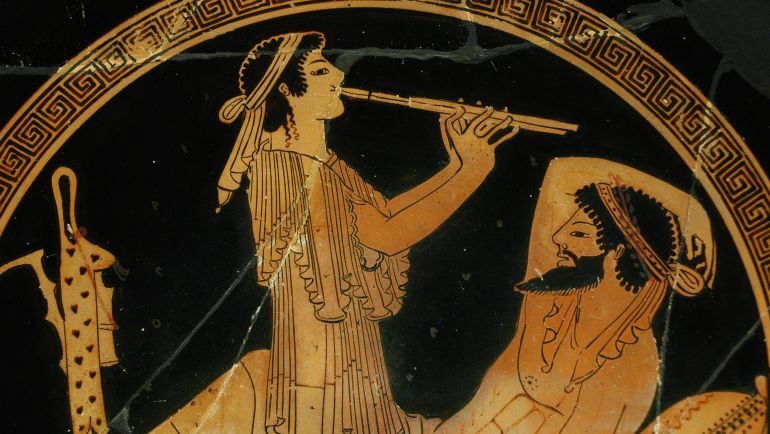 From the historical perspective many scholars believe that music played an integral role in the lives of ordinary ancient Greeks, given its role in most social occasions – ranging from religious rites, funerals to theater and public recitation of ballads and epic-poetry. Both archaeological and literary evidences rather bolster such a theory that points to the crucial nature of music in ancient Greece. In fact, the Greeks attributed the ‘creativity’ of musical compositions to divine entities, and as such etymologically the very word ‘music’ is derived from ‘Muses‘, the personifications of knowledge and art who were the nine daughters of Zeus and Mnemosyne. Interestingly, Mnemosyne herself was the personification of memory, and was also one of the Titans, the children of Uranus the Sky and Gaia the Earth.